On this day in 1961, a Reuters story in the New York Times reported that two more British shipbuilders had put in a bid to build the Queen Mary's replacement, for the "stateliest ship afloat" was now in her twilight years. The company, Vickers-Armstrongs and Swan, along with another, Hunter and Wigham Richardson, intended to form a joint company, each with a half interest. Had they won the contract, the keel would have been built at Wallsend, Tyne and Wear, England, with the outfitting taking place at the Walker Naval Yard in Newcastle-upon-Tyne. Little did they or the other six bidders know that the 70,000 ton ship, expected to cost £30,000,000, would never be built due to lagging passenger revenues on the transatlantic route. 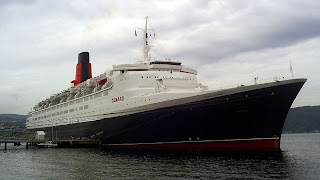 However, in 1965--when the original ship was projected to sail on its maiden voyage--Cunard had apparently changed its mind; in July of that year, the keel was laid down in the John Brown Shipyard, Clydebank, for the Queen Elizabeth II [pictured above].